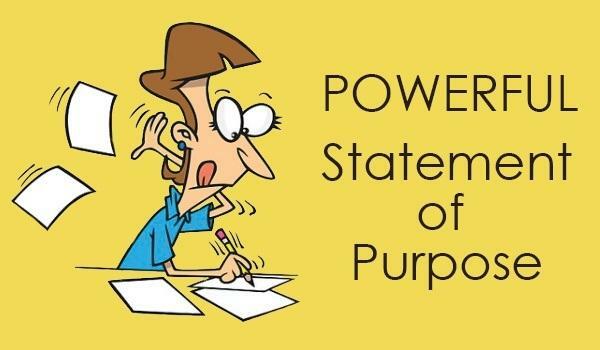 What is a Statement of Purpose (SOP)? 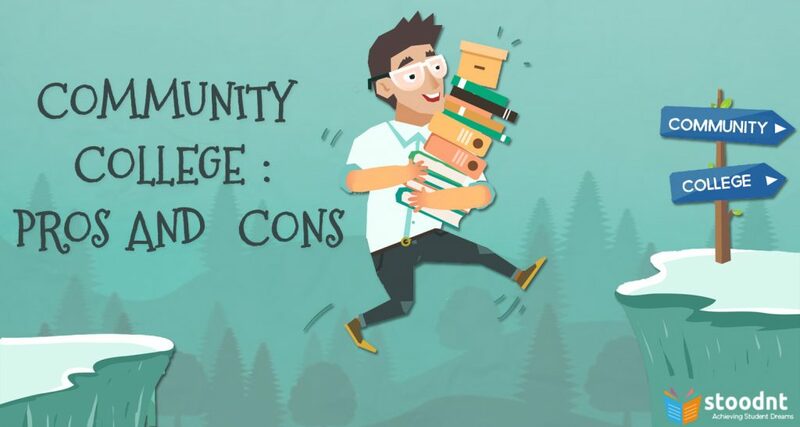 Why do the universities and colleges ask for SOP? How important is SOP in the admission process for foreign universities? How to write SOP? What to include in an SOP? What should be the ideal format (and flow) of an effective SOP? We will tackle these questions in this post. Since you are reading this, I assume you are gearing up for the application round of the foreign universities and colleges. While preparing the application kit, most of the applicants struggle to write a good statement of purpose (SOP), which is a mandatory component of the application process. Although the SOP is required mainly for the MS, MBA and PhD admissions, colleges sometimes also ask for SOP for undergraduate admissions. Some institutes also ask for Personal Statement, Application Letter or Letter of Motivation. Although there are few minor differences, statement of purpose, letter of motivation and personal statement – they all serve the same purpose. 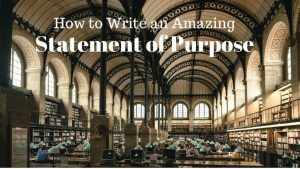 The statement of purpose is an application essay a student applying for a graduate program at a foreign university is required to write in order to be admitted to the program. It’s possibly the best way to express your goals and achievements impressively to the admission officers and faculty members of your discipline. Why do universities ask for the SOP? 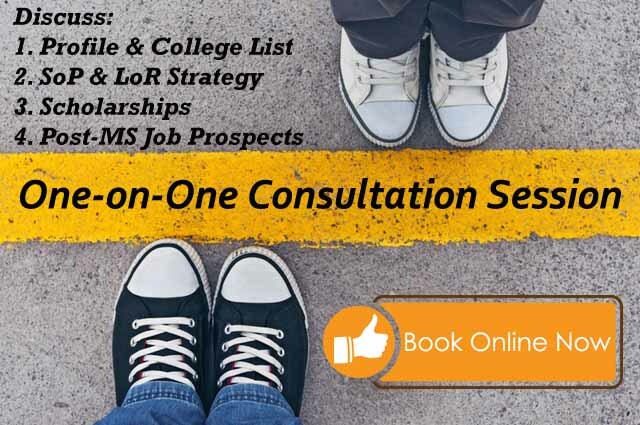 The SOP helps colleges and universities to decide if the applicants are really interested in the program that they have applied for, their ability to pursue the program and completing it successfully, and whether they will be able to contribute significantly to the Institute. Just like a good cover letter or job application letter helps candidates present themselves successfully in the job market, a good SOP helps applicants to highlight their strengths during the admission process abroad. A good SOP attracts the admissions officers who wade through hundreds of applications. Attending a graduate school is an important part of your higher education. You should have a goal and you should know how you are going to get to your goal and why do you want to get to your goal too. Universities treat SOP very seriously and they read your SOP. So, you better take it very seriously. 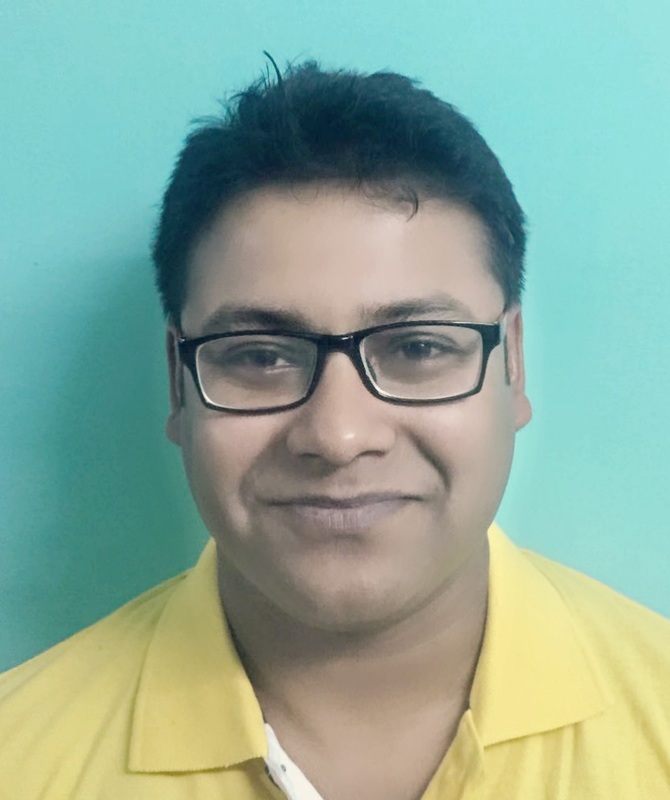 The SOP is considered to be one of the most critical components of your application; perhaps the most important part of the entire admission process. The SOP portrays the most significant impression of yourself to the admission officers. Your SOP will say a lot of thing about you silently that a strong profile might never be able to speak out. The SOP tells your attitude, your ambition, your clarity of thought and your personality; and carries the potential of leveraging low GPA and/or average test scores (SAT, GRE or GMAT). While the GPA and test scores are essentially objective in nature, the SOP is the subjective aspect of your application. The SOP gives you the real opportunity to stand out from the crowd. Specific classes, special courses or projects you have taken, that are related to your field of interest. Why should you get admitted to this program? What values will you bring to the institute and to your peers? 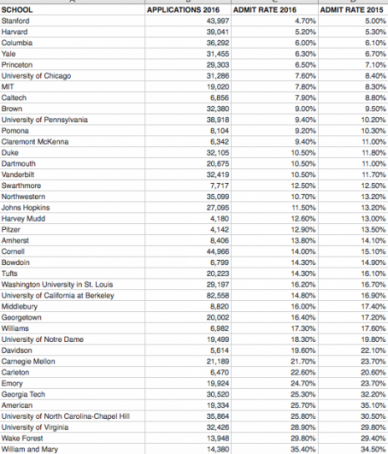 What do you understand about the student community and college culture? Why do you think you will fit in? How will this program help you to achieve your career goals? What is that one unique aspect/characteristic about you that the admission officers should know? Why does it matter to the admission officers and/or to the fellow students of your class? How to write a good SOP for MS? You need to start with introspection and recapitulating all the important events in your life that have influenced your thoughts, personality, and actions. You need to spend a lot of time looking inwards (well I am not suggesting meditation of Yoga though). For the majority of the MS applicants (without any work experience), there’s hardly anything outside the academic world. So, it would be best to talk about motivations, aspirations, interests, vision, values, mottos, career goals, hobbies, strengths, weaknesses, and even failures. When you are applying to a university, you are aiming for an academic upgrade in a specific domain. Then, it’s not only a foreign degree, but there is also a bigger purpose – getting a job (unless you plan to attend a foreign university just for traveling to foreign locations). You need to tell clearly about your expectations for your intended program and the university. Have a look at this example below. The candidate has spoken his/her heart out. But, this is actually quite vague. Harvard University cannot change your life when the candidate is blaming destiny. Here comes the research part. You need to research the university, the department, the curriculum, the professors, the university culture and the current students and alumni. Now, take a look at this one below. Might not be perfect, but this candidate is talking about specifics, and it’s more credible. The candidate has tried to connect the dots – the life events that influenced his/her thoughts and actions. 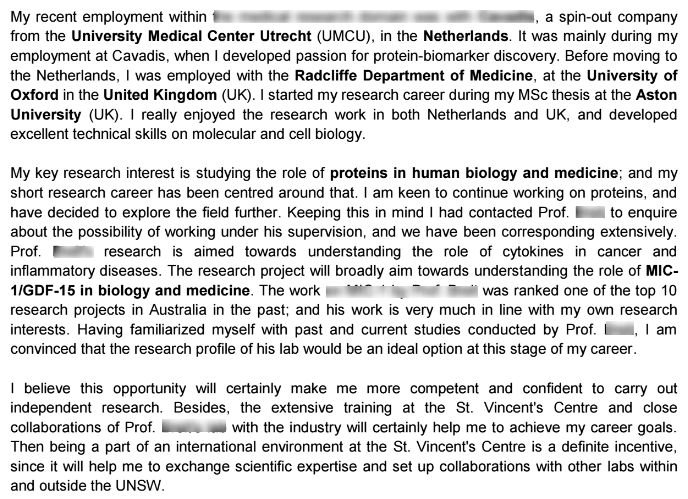 It shows that the applicant has done research about the university and the faculty members. Don’t just tell, you need to demonstrate your passion. You can excel in a field, only if you have a passion for it. The reader must know that you are genuinely passionate about the particular field. So, it is critical to express in an interesting and convincing manner. Your potential is your ability to excel at something. You should discuss the relevance of your recent activities and achievements, and summarize your undergraduate career. You need to demonstrate your potential to pursue the intended program and complete it successfully. You need to talk about accomplishments in academic and co-curricular activities. It needs to show that you are well-prepared for the program. The SOP is rightly called a Personal Statement as you need to give an indication of what type of person you are and express your suitability for the particular program. Don’t shy about adding some failures, if applicable. The admission committee will accept or reject your application on the basis of your GPA, test scores, recommendation letters etc. Usually, MS admission process doesn’t involve interviews, unlike MBA or Undergraduate admission processes. This makes the SOP very critical in the MS admission process. 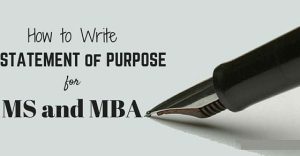 While most international business schools include a set of MBA essays in their MBA admissions process, some ask for an SOP as well. While MS applicants are usually freshers, MBA applicants are older and more mature. An MS SOP can be more technical in nature. MBA applicants need to do balancing the technical aspects and managerial potential in the SOP. You need to include examples of leadership, personal integrity, and attitude so college admission teams can know who you are and how you plan to contribute and make a difference to the class. Start early and spend good enough time on introspection and brainstorming ideas and life events. Put focus on self-motivation, passion, competence, and potential. Write in active voice, and not passive voice. Use formal, but conversational tone. Unless the specific program says otherwise, be concise; an ideal essay should say everything it needs to in the word range of 500 – 1000 words (1-2 single-spaced pages in 12 point font). Make it a compelling story and not a dead cold and boring statement. Have a look at this example below. Add specifics and quantify your story. Here is a relevant example. Don’t sound vague. Introspect and add credibility to your story. Don’t create fake stories. Be honest and original. Do extensive research about the university, campus culture and faculty members. Include the names of one or two faculty members in that university and what you know of and appreciate their work, and why you want to study or work under their guidance. Here is another example. Mention what you like about the university you are applying for, and why: campus, facilities, labs, infrastructure, etc. Ask your teachers and faculty members for advice. Be creative, but don’t go overboard. Make the statement easy to read. Proofread, edit, re-edit and ask for feedback. Need help with writing SOP? We won’t write the SOP for you. But, we can help you to brainstorm ideas, proofread, edit and review the SOP for you. You can opt for our SoP services. If you don’t need a full-fledged service. You could also book a session to discuss the SoP strategy and pointers. Use of quotations at the start of your SOP is actually a bad idea. The admission officers want to know your thoughts and words, not someone else’s. Writing a general statement won’t take you anywhere. Include facts and personal examples. Putting too many details about academic grades, test scores, and technical details in the SOP is boring. The admission officers can see your GPA, test scores, and technical skills in the application kit and CV. Include new information that is not present in any other component of the application kit. Failing to justify why this university and course if perfect for yourself; and how this program can help you with your career objectives. Using acronyms is wrong. Use full forms, at least in the first place. Inappropriate use of humor, clichés, and poems; avoid these at all costs. 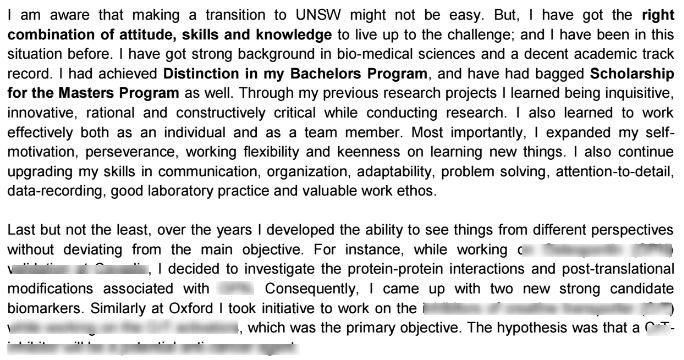 Here are a few snippets of my Personal Statement that I used while applying to the University of New South Wales in Australia. Few words and phrases have been blurred for confidentiality issues. How to approach your employers for reference letters for applying abroad? Key Sources: CrunchPrep, MBA Crystal Ball, The Hindu, University of California Graduate School, Berkeley Graduate Division.